We couldn't be more excited about The Flash TV series, debuting on October 7th. But that's doesn't mean we're not a little worried, too. The Flash comics are filled with goofiness, weirdness and a touch of pure stupidity that we hope never make it to the TV show — here's eight "Flash facts" the show can skip. Jay Garrick became the first superhero known as the Flash when he played around in radioactive hard water. Even in the DC universe, his adventures were chronicled in comic books, which we know because young Barry Allen read them, and The Flash was his favorite character. In fact, when Barry was struck by lightning and gained his super-speed, he took the name of the Flash in honor of Garrick. This is really dumb and unnecessarily goofy. In fact, it would probably be better to do away with Garrick's character entirely — or, if he's introduced, not to have him inexplicably also have Flash powers. Honestly, the Flash TV show should probably do away with the Flash time-travel powers altogether. If not for the poor CW show's budget, then because again, the Flash's varied adventures in time make Doctor Who look like a bastion of continuity. Whether he's accidentally sending aliens back in time, fighting evil speedsters from the future, or completely moving to the 30th century to hang out with the reincarnation of his wife, the Flash is, temporally speaking, all over the place. Add in the five or so other Flashes and Flash friends with time-traveling speed powers, all of whom careen through the timestream like scarlet tornadoes of destruction, and you have a complete mess. Best for the TV show to either use it sparingly — like, maybe once — or ignore it completely. Time travel is one of the many powers granted by the Speed Force, the extremely weird cosmic/possibly divine source of the Flash's power. I have no issues with the TV show presenting the Flash's powers as accessing something called "the Speed Force," because it's mainly semantics. The problem comes if the show tries to add almost any of the Speed Force's other details. Let me give you the "basics" of the Speed Force, courtesy of Comic Vine: "By running, Barry generates a kinetic wall between the present and the time barrier that manifests as electrical energy that touches every part of reality and contains the knowledge of every place and every time." …yeah. It's also sometimes a physical space. Sometimes it's something with a physical shape that can be handed around. Sometimes it's basically the afterlife for people with speed powers. It messes with aging and healing and time. Now in Grant Morrison's Multiversity it's like a crunchy candy shell between all the alternate Earths and places like Apokolips. Best for the TV show to call it a "mysterious power" and leave it at that. By which I mean significantly more ridiculous than time-travel. Besides all the confusion and weirdness saddled onto the concept of the Speed Force, nothing is dumber than some of the powers it gives the various Flashes. Somehow users can make solid constructs out of it. One Flash had the ability to sense when any object in the world moved, effectively granting him a bizarre form of ESP. The Bart Allen Flash could create duplicates of himself and send them forward and backwards in time. The dumbest ability, however, has to be his power to create pockets. On his uniform. For holding things. With speed. Sigh. There is one completely awesome power that The Flash TV show probably should avoid as well — the Infinite Mass Punch, where the Flash runs at top speed and punches something with "the force of a white dwarf star." It's sounds amazingly cool, but I feel like once the Flash star-punches something on the show all we're going to do is wonder why he doesn't star-punch everything. 6) "The Trial of the Flash"
It's a great name for an episode, but it was also a very bizarre moment in the Flash comics. See, Professor Zoom (also known as the Reverse-Flash) is the evil speedster who killed Barry's mom, which Barry's dad was convicted of and imprisoned for. At one point, Zoom was trying to wreck all aspects of Barry's life, and murdered his wife Iris Allen (née West). Barry tried to get over it and ended up engaged to a lady named Fiona Webb, and Zoom tried to murder her too; Barry managed to save her by breaking Zoom's neck, killing him. Of course, the Flash immediately gets arrested for murder, despite the fact that Zoom has never been put on trial for anything, ever. The result is that Barry time-travels to the 30th century and marries the reincarnation of Iris. Seriously, it's best to just avoid this thing altogether. The Flash is generally considered to have one of the best rogue's galleries in comics, despite the fact that really, given that he can move at the speed of light, almost none of them should give him any trouble. I mean, a dude named Captain Boomerang is one of his most major foes, and his power is throwing boomerangs. But the Fiddler… man. This guy basically bullied an Indian fakir into showing him how to hypnotize people with his music. Since then, he's gained the power to shoot destructive waves from his fiddle, as well as open dimensional portals, which makes Captain Boomerang seem like the most reasonable character in comic book history. Even if the Flash couldn't outrun sound — which he very much can — being even slightly inconvenienced by an evil fiddler is so embarrassing most viewers would likely turn off their TVs in disgust, and that's assuming they could get past the fact that the Fiddler actually plays a goddamned violin, not a fiddle. 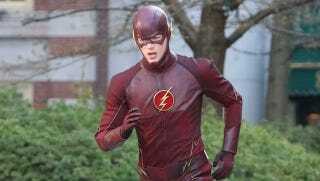 To say the TV series shouldn't kill the Flash is a bit disingenuous. The Flash comic character, no matter whom the incarnation, has a deep history of sacrificing himself, often saving the DC universe from a Crisis in the process. And it wouldn't be too hard for the TV show to kill and then resurrect Barry — likely in a season finale and the next season's premiere — as long as they only did it once. But if Barry ever dies, please, please don't let the TV show turn him into the Black Flash, which is to say the incarnation of Death specifically for speedsters. Not just because it's very silly to have a single incantation of death for a dozen people who mostly wear red tights, but because this comic story, titled "Rebirth," including a chase between Barry and Zoom through time where they become the lightning bolt that gives Barry his original powers. We can do without that goofiness, thank you.